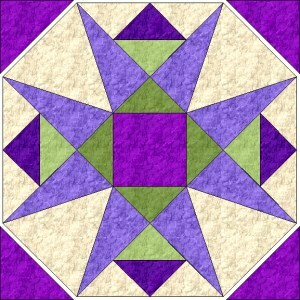 Complete instructions to make 1904 Star quilt block in multiple quantities. Note: strip width for peaky and spike units are slightly larger than actual templates because of the angle. While I make every effort to be sure of accuracy, I am unable to test every variation. Before you cut up large amounts of fabric, cut and sew a test block or two. 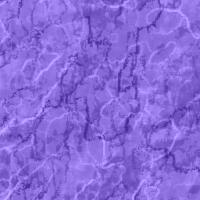 If you find any errors, please email me at "jeannethro2 at yahoo dot com". Cut 5 strips 2 inches wide.�Subcut strips into 72 quarter square triangles using a quarter square triangle ruler. Cut 3 strips 43/4 inches wide.�Subcut strips into 36 peakys. Cut 3 strips 2 inches wide.�Subcut strips into 36 quarter square triangles using a quarter square triangle ruler. Cut 2 strips 43/4 inches wide.�Subcut strips into 36 right spikes. Cut 2 strips 43/4 inches wide.�Subcut strips into 36 left spikes. Cut 2 strips 31/2 inches wide.�Subcut strips into 36 half square triangles using a half square triangle ruler. Cut 1 strip 31/2 inches wide.�Subcut strip into 9 squares. Align the long edge of 2 fabric 3 quarter square triangles on opposite sides of the fabric 5 square, right sides together. 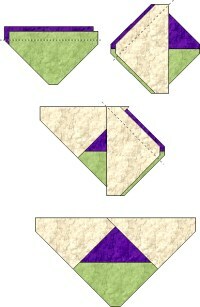 Sew a ¼ inch seam along triangle long edges; press seams toward triangle. Align the long edges of 2 more fabric 3 quarter square triangles on remaining opposite sides of fabric 5 square, right sides together. 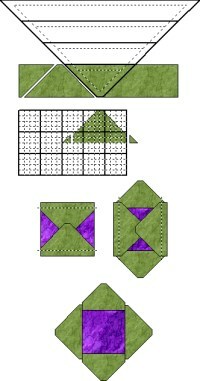 Sew a ¼ inch seam along triangle long edges; press seams toward triangles. Make 9 square in a square on point units. 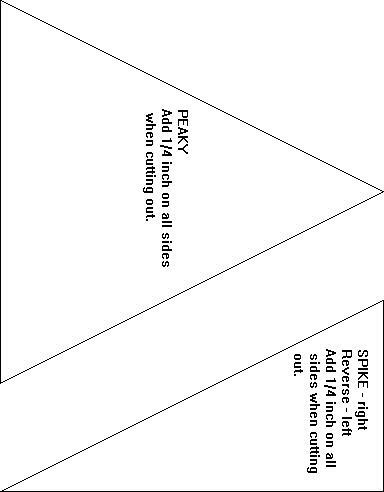 Align raw edges of a right spike triangle to right long side of peaky triangle, fabric right sides together (you should have tails from spike triangle hanging over). Sew a ¼ inch seam on edge just aligned; press seam toward small triangle. Align raw edges of a left spike triangle to left long side of peaky triangle, fabric right sides together. Make 36 peaky and spike units. Align a fabric 2 and fabric 6 quarter square triangle on long side, fabric right sides together. Sew a ¼ inch seam; press fabric toward darker fabric. Place 2 fabric 1 quarter square triangles on either side of square forming the larger triangle. Flip a triangle over on to the square where they should be sewn, fabric right sides together. Sew a ¼ inch seam; press seams toward fabric 1. Repeat to sew the remaining fabric 1 quarter square triangle on the other side. Make 36 quarter square units. Layout center star as shown with square in square in the center, peaky and spike units adjacent to center unit square, and previously sewn triangle in the corners. Flip column 2 on top of column 1 right sides together and sew together with a ¼ inch seam. Do NOT cut apart between rows. Open and flip column 3 on top of column 2 right sides together and sew a ¼ inch seam. Again do NOT cut apart between rows. Turn your work and flip row 2 on top of row 1. Sew together with a ¼ inch seam. Open and flip row 3 on top of row 2, fabric right sides together. 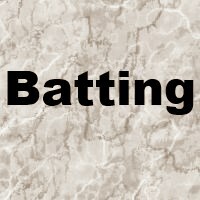 Sew a ¼ inch seam. Sew 9 center star units. 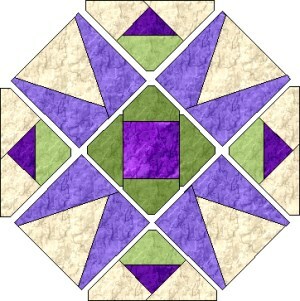 Align 4 fabric 5 half square triangles to corners of center star to form a square block. Flip triangles on long side, fabric right sides together. Sew each triangle with a ¼ inch seam and press seams toward triangles. Make 9 1904 Star blocks.